Classic, chic and chunky pieces take center stage this season. Play (P2,790 each). 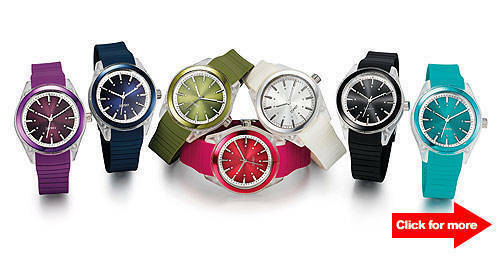 Click for more watches and jewelry by Esprit. This season, trendy timepieces and jewelry from Esprit, Esprit Collection and edc by Esprit flaunting meticulous detailing in classic and hip designs take center stage. 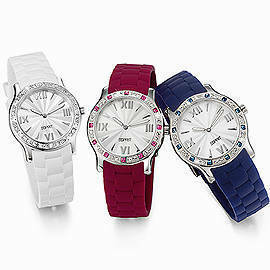 The women's watches range from Broadway, which comes with a pure silver-link strap decorated with fine cubic zirconia, to Animalique, which has a reptile-skin pattern on the dial and a delicate double-chain strap. Men's watches include timeless designs such as Avalance, with its narrow bezel and wide face, and sporty models like Gran Orbus, a chronograph watch that comes with a metal or smooth calfskin strap. For men and women, the urban and military-esque Bold has matte finishing in anthracite, while the minimalistic and plastic Play designs range from shocking pink to elegant white. Esprit Collection also presents a variety of jewelry pieces. Highlights include the zirconia-studded Amorbess necklaces and rings, the ring combination Peribess, and the matching Chione cocktail ring and necklace. Esprit watches and jewelry are available at SM, Robinsons, Landmark and Metro Department Stores; Watch Republic branches; and other leading watch shops nationwide.